When Dinh Quan carefully sands down his lacquer painting, the colors and design start to peek through the top layer. The magnificent design that he had painstakingly covered with layers of lacquer and left to dry for hours reveals itself. Once the design is dried and finished, he adds one more detail to the painting that makes all the difference. Dinh Quan is a Vietnamese artist, who has been specializing in traditional and contemporary lacquer painting for 36 years. His workshop is nestled in one of the many winding streets of Tay Ho. Quan paints vivid lacquer paintings of women and also produces various abstract paintings. Quan was born in 1964 in the coastal town of Haiphong in the Northern region of Vietnam. 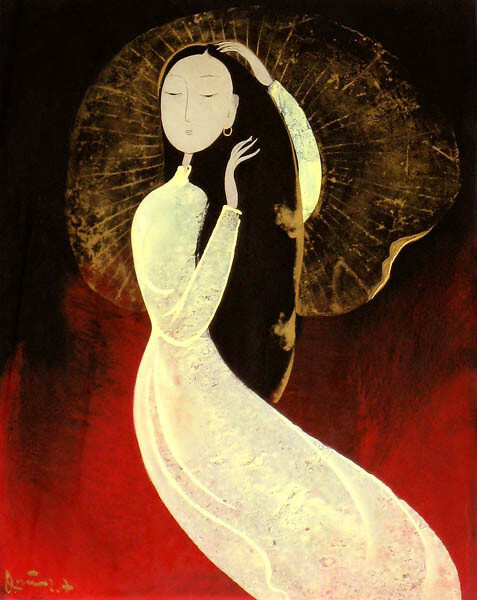 He studied and developed techniques of traditional lacquer paintings at the Hanoi Fine Arts college until he graduated in 1990. From then on, Quan’s works began to attract increasing attention from the art world. Quan described the process of creating his artworks. “If I don’t like the painting, I destroy it, maybe burn it, and then I will redo it to make it better,” he said. He usually paints about twenty to thirty paintings per year and at the end of that year, he chooses those he most prefers for display in various museums. Because it takes time for the layers of paint to dry, Quan paints five lacquer paintings simultaneously. Quan has exhibited his artworks in many countries around the world including Japan, France, the United States, and the United Kingdom. His works are part of the art collections in the Singapore Art Museum, the Thavibu Gallery in Thailand, the Vietnam Fine Arts Museum, and the National Art Gallery of Malaysia. Quan integrates his political views, his memories of youth, his religious beliefs, and the history of Vietnam into his paintings and sculptures. Many of his lacquer paintings embody the female icon, and his abstract lacquer paintings have different colors and shapes to express a particular emotion. Women are often painted in a surrealist style, and hence, they possess ghostly facades. Nevertheless, they also have a strong presence due to vivid colors that Quan used to render them. He did this because, in Buddhist and Vietnamese culture, the female essence represents strength as well as hope. Quan said that his style frequently changes as he tries new and different painting techniques. He keeps at least one painting from each of the styles that he has tried, but he has no favorite. Instead, his favorite changes over the years. Quan first paints a wooden board with black lacquer. He then sketches the design on the board with white chalk so that if he makes any mistake, he can erase it. Next, he chooses the colors for the painting. Quan applies several layers of different lacquer colors over the design. When all layers are applied and dried, he smoothes out the surface of the painting by using fine sandpaper. This is when the design will come up through the lacquer paint layers. After that, he polishes the painting to make it lustrous. He prefers shiny finish on paintings because he likes it when people look at his paintings and, as he put it, “see themselves in the mirror of society”.